Since the introduction of Google+, Google has been redefining how it can provide more relevant search results. Recently Google introduced Search, Plus Your World, something I’ll call Google social search. This new enhancement has made it essential to have a Google+ profile and/or Google+ business page. Why? Google is highlighting Google+ content in search results. This article will share three tips you need to know to benefit from Google social search. By the way, if you haven’t already done so, create a Google+ page for your business. 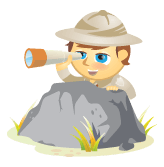 Fill out all the sections with images and top focus keywords you want to rank for in search. Once the page is created, engage with people and other businesses, share great content and post publicly every day. When logged into Google+ and searching on Google, Google social search defaults to Show Personal Results. Google has always shown personalized results based on browsing history and location. Now content that’s been shared with you through the Google+ social network is incorporated into results. The Google personalized results are identified by the highlighted areas. The box on the top left points to a message that, in this example, says that there are “60 personal results and 5,810,000 other results” that have been found. Some of the 60 personal results will be blended into the first page shown. Personal results are identified by the blue person icon in the left hand margin as shown above. The box on the top right indicates that personal results are being displayed. You can select the globe or public icon on the right to switch to non-personalized results. When I search "social media," the personal result count is highlighted as a link. Clicking on the “170 personal results” link as shown above, switches the results page to only display the personal results. Google’s aim is to provide hyper-personalized—and therefore more relevant—results to users. Within public search results, weighted social search signals may come into play, corresponding with the growth of the +1 button. People and pages you have circled are likely to show in Google social search results, so it’s important to build your audience on Google+. Another way to catch the eye of Google users is to appear in Google’s Related People and Pages based on the user’s search query. Promoting your Google+ page is important to grow reach and build a large following. 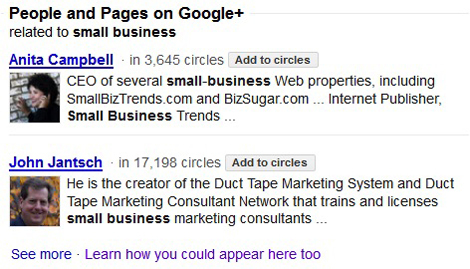 To appear prominently in Google social search, you need to be circled already or market yourself to be circled. One of the best ways to expand the number of users who have circled you is by appearing in Google’s Related People and Pages. 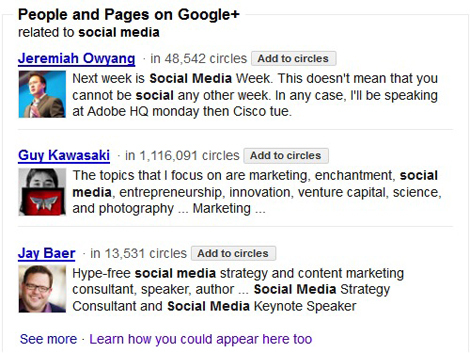 Keywords for Related People and Pages on Google+ are highlighted within the Google+ profiles. According to Ian Lurie, “Google’s far more likely to show a plus box for broad concepts with low commercial intent versus niche terms with high commercial intent.” You can test this by searching social media versus social media for nonprofits or fashion versus women’s clothing. In his Google Plus Box Ranking Factors Report, Lurie examines the different Plus Box ranking factors and concludes that reach and follower count are very important. The number of +1s matter, in addition to the frequency of updates. In his study, pages or people who haven’t posted within 72 hours did not appear in the Google Plus Box. Google will continue to adjust the Google social search algorithm, as well as the Plus Box results. However, “it now matters who has you in their social circles, and who has THEM in their social circles,” states Chris Brogan. Due to Google’s emphasis on +1s and reach, it’s important to build your company as an authority in your industry. As with all of your work, focus on gaining the attention of people on Google+ with quality content. The +1 has a lot of power, so create good content and post regularly to encourage users to +1 your material. Google will see the signal from other Google+ users that you are a quality and relevant business. You may see a boost in your ranking due to your efforts. Use keywords relevant to your industry and expertise on your Google+ page. The description for your page in the Google Plus Box can be pulled from a number of sources, ranging from page posts to the introduction as shown below. The phrase "social media" is found within the introduction, tagline, occupation or posts. While Google is providing this new opportunity for exposure, Google is also limiting something important to businesses. Google rolled out Secure Search for signed-in Google users in November 2011 in preparation for Google’s social search. Danny Sullivan interviewed Amit Singal, who oversees Google’s ranking algorithms, and learned that Google has been working on the encryption to protect personal results for at least a year. If results for Google social search were not secure, content that was shared on Google+ privately could be revealed publicly within searches. All Google social search results are hidden behind https:// and no keywords will be linked to your search in any analytics programs. Many users always remain logged into Google, which limits the keyword data found in analytics software. Marketers have seen an increase in the excluded keyword data. For one company, 12.4% of total organic traffic data was encrypted in November and rose to 16.9% in January when Google social search was released. The encryption that Secure Search provides means that any private material mixed in with your regular results is protected, seen only by your browser and Google. While a user’s privacy is protected, marketers focused on organic data are losing valuable information. Organic keyword data will be limited, so it may be harder to determine user intent based on search queries. What do you think? Are your search results more relevant and has your business seen Google+ growth since the advent of Google social search? Please let me know your experience so far and additional tips you would like to share! Leave your questions and comments in the box below. Sarah Lokitis is Social Media Manager at Search Mojo. She specializes in social media best practices for SEO and Facebook Advertising. Follow her on Twitter as @Lokitis.